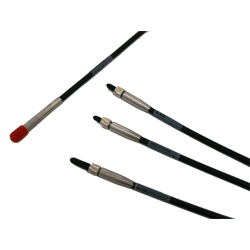 The TFA trifurcated fiber optic bundle series combines optical fibers at a common end with the fiber optic bundle trifurcated into three separate channels, terminated with standard SMA 905 connectors. TFA bundles are comprised of one common end with seven 400µm NIR optical fibers in a “6 around 1” configuration, terminated with a probe tip. Through one channel (normally connected to a NIR spectrometer) three of the seven optical fibers are terminated in a slit configuration. Through the middle channel (normally connected to a tungsten halogen light source) three more of the seven optical fibers are terminated in a round configuration. Through the last channel (normally connected to a visible spectrometer) the last optical fiber is terminated in a SMA connector.